Puig not an All-Star? Hey, Pap, stick to working the ninth – not the media. I’ll start off by declaring my completely unabashed impartiality relative to Dodger baseball. I’m a southern boy, love the Braves and don’t have any love or hate for the west coast. With that being said, I can’t get Yasiel out of the box in my living room and I’m loving every second of it. 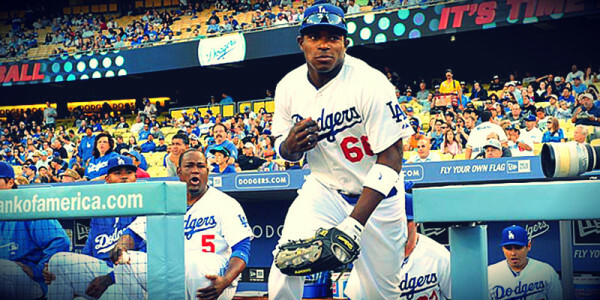 Drawing physical similarities to a young Bo Jackson, Puig doesn’t look like a ballplayer – more like a linebacker. Consider that, in 27 games or less than 1/6th of a major league season, Puig has a slash line of .443/.473/.745 to go along with 8 homers, 6 doubles and 17 RBI. Small sample sizes make his batting average a bit tough to buy, but that power is beyond legit. It wouldn’t be the first time a seasoned major league player took exception to an upstart. Every year we seem to be forced into this discussion of valid versus hype induced All-Star nods. Whether it’s Harper, Trout or Strasburg, young guys seem to fall victim to this onslaught of fraternity style initiation. It’s the old “You have to pay your dues” mentality – you’re ready when you’ve earned our respect. As a fan, Papelbon’s opinion on this topic is mute. The All-Star game isn’t the exhibition game of old. It counts – a lot. With home field advantage on the line, guys like Puig have to be evaluated based on their contributory capacity in the moment – not retrospectively. If the All-Star game had been played in April, John Buck would have been a rational All-Star choice at Catcher. We know now he was streaking, but would that have been relevant at the time? Any clear assessment shows that Puig is crushing NOW, and whether he still holds that stat line in September means nothing on July,16th at Citi Field.